The Diocese of St. Augustine opened Tampa Catholic High School on September 4, 1962 to serve the needs of Catholic education for the parish families of Hillsborough County. The school was guided through its early years by Monsignor John F. Scully, the founding President, and was staffed by Diocesan Priests, the Dominican Sisters of Adrian, Michigan and dedicated lay personnel. The school opened with one classroom building and a convent. After spending one year in temporary quarters at Christ the King, 230 9th and 10th grade students made their way to the new Tampa Catholic campus. TC was initially planned to house a girls’ division to be known as Lourdes Academy; the boy’s division was to be located elsewhere in Tampa. The plan was changed to provide a coeducational facility, taking into account the already operating Academy of Holy Names and Jesuit High School. The campus consisted of only the South and Center buildings with the library, chapel and administration located in the Center building. The early classes were held in eight classrooms with a Chemistry-Physics-Biology laboratory, a Home Economics room, a Library, and an Administration area. In 1964 the first class of seniors was enrolled and the multi-purpose building (now the cafeteria) was completed. In 1965 Tampa Catholic graduated its first class, numbering 51. This was also the first year TC had a full squad for a football team, playing a schedule of both JV and varsity games. 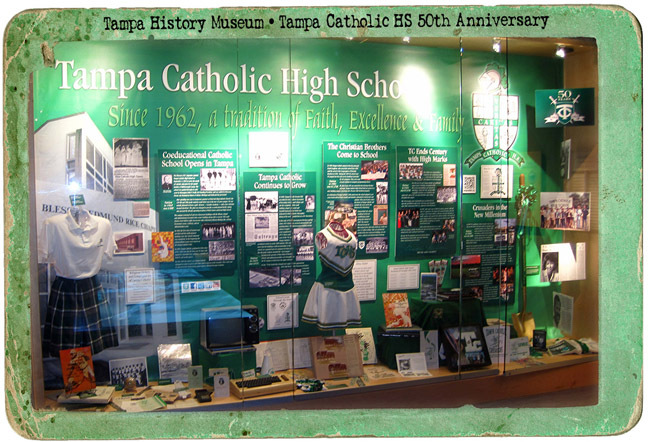 The school mascot at the time was known as the Tampa Catholic Colts. For the 1965-66 school year Tampa Catholic changed its colors to green and white and its mascot to the Crusaders. 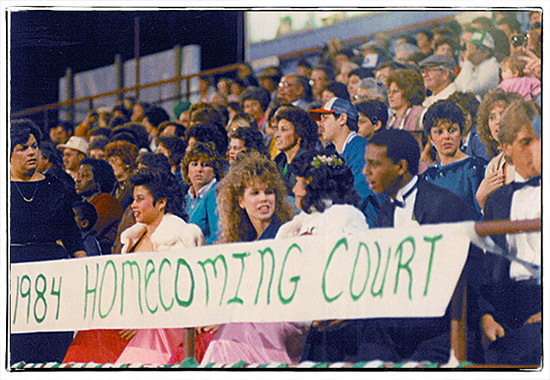 That same year TC played its first homecoming game against Admiral Farragut Academy. In 1968, Tampa Catholic became fully accredited by the Southern Association of Secondary Schools and Colleges and saw the completion of the north building, chapel, gym, track and baseball diamond, all of which were dedicated by Bishop Charles McLaughlin, Bishop of the newly founded Diocese of St. Petersburg. 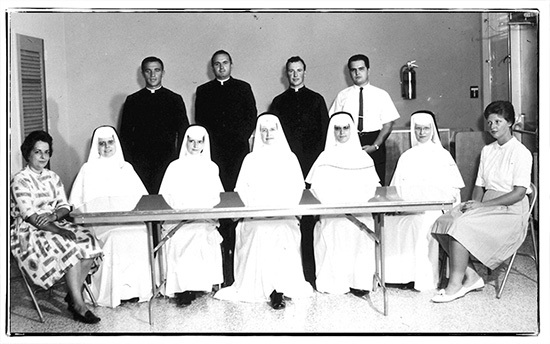 In the early 1970s the Assumptionist Brothers and the sisters of St. Chretienne assumed administrative and teaching duties. The Administration building and the Library Complex were completed in 1972. These early years of the 70s saw Tampa Catholic’s enrollment rocket to nearly 1500 students. This was more than the buildings could accommodate so the school was separated into two campuses for three years. The 9th grade students attended the “East Campus” located on the grounds of Mary Help of Christians School, and additional portables were brought in to the TC campus to help house the upper classmen. In late 1979 the leadership changed once again with the appointment of Br. Jude Byrne, of the Franciscan Brothers Community taking over as Principal. Following several changes in administration, stability was once again gained by the 1984 appointment of Br. John Casey of the Congregation of Christian Brothers. By this time Tampa Catholic High School had grown to a nine-building campus stretching over 40 acres. During the 1983-84 school year, TC jumped into the tech era by installing the first computers on campus. They were used to teach students in computer programming classes. In celebration of Tampa Catholic’s 25th anniversary the school adopted a new coat of arms derived from models and sketches submitted by both faculty and students. This coat of arms evokes the history of Tampa Catholic and includes the crest used by the Diocese of St. Petersburg. Over the next 15 years Tampa Catholic saw additional improvements, including the installation of a school wide air conditioning system, renovations of the three classroom buildings and upgrades in technology. 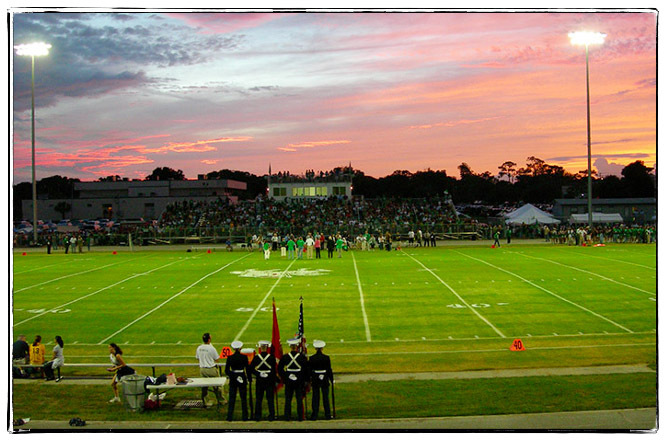 In 1997, after many years of effort from the alumni, parents, staff and general TC supporters, the Tampa City Council was persuaded to alter the zoning so that Tampa Catholic could move forward with plans to build a stadium and upgrade the athletic portion of the campus. Even with the approval of the City Council, stadium efforts were postponed for the greater good of the educational institution, and in 2002 efforts moved forward to establish a Master Plan for the 40-year-old school. This plan called for needed upgrades to the academic portion of the campus and ground was broken that same year. In 2003 these needed improvements were completed, including the new Archbishop Joseph P. Hurley Science & Technology Center and the new Blessed Edmund Rice Chapel. Bishop Robert N. Lynch dedicated both buildings on August 27, 2003. Now with the new academic facilities in place it was time to address renovations and improvements for the eastern part of the TC campus. These improvements would be funded by the “Come Home To Rome” campaign, which started that same year. 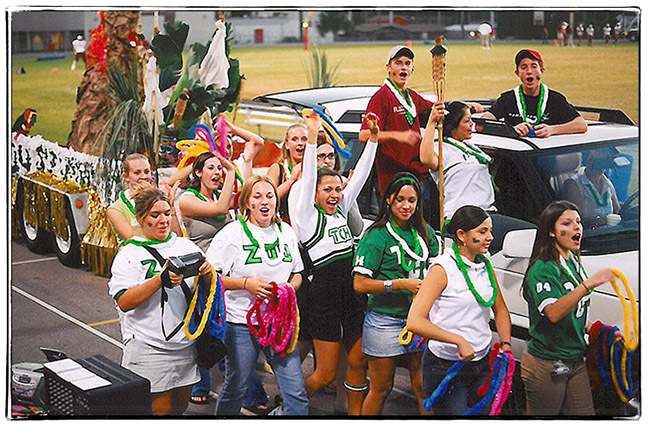 Tampa Catholic celebrated a true homecoming when the 2005 homecoming football game drew over 3,000 students and alumni to the newly constructed football stadium. Soon after, a new rubberized surface was installed on the track. The school’s 13th principal took over in 2008 and lead the school through its Fiftieth Anniversary during the 2012 school year. During his time, as principal, improvements included a newly refinished gymnasium floor with new athletic logo and the completion of lighting the softball & baseball fields for nighttime games in 2013. In 2016 we welcomed new school Principal, Mr. Robert C. Lees to guide Tampa Catholic through a new master plan. Today TC has more than 760 students enrolled in its college preparatory curriculum and 99% of its graduates continue their education at a college or university. The school now has more than 9,100 alumni who proudly live the school’s ideal of Faith, Excellence & Family in Tampa and throughout the world. Praise her to the sky. Strength and joy of youth.